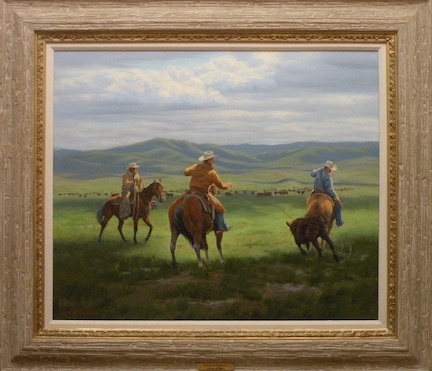 Western art of Lorna Dillon, painting cowboys, horses, cattle ranches, vaqueros, and the American landscape.
" Roping in Parkfield "
on the nutrient rich grasses. © All works shown are copyrighted by Lorna Dillon who retains all rights of reproduction. Any reproduction or representation of any portion of this site without express written permission by the artist is strictly prohibited by law.